There was plenty of space for our family of four. Location was good and staff were very helpful. Security building. It is close to metro station and foods. It felt like very safe neighborhood. It is really close to Sagrada Familia and Metro Station The apartment is big enough to accommodate 4 persons. Facilities are good and Andrea was so helpful. Due to the deceptive nature of the information on the Booking.com site, my entire experience was negativity affected. Beautiful apartment, it looked exactly what the pictures displayed but better. Great location, close to the metro and so many attractions! If I ever come back to Barcelona, I will definitely come back and stay here. The street the apartment is on is quiet but has lots of great shops and restaurants. the host was very welcoming, kind and helpful. the location is great. The apartment was clean and the locations was great! . I did appreciated that fact that includes a washing machine in the unit. There was nothing special about the apartment. Below average. Host was very friendly and attentive on everything. Lock in a great price for Lodging Apartments Sagrada Familia – rated 8 by recent guests! Featuring free Wi-Fi and air conditioning or roof fans, Lodging Apartments Sagrada Familia is located within 5 minutes’ walk of Sagrada Familia and Plaza Gaudí Park. Set in Barcelona’s center, these modern apartments offer a ticket service and tour desk. Offering stylish and colorful décor, the apartments include a living-dining room with a flat-screen TV. The kitchenette is equipped with a washing machine and oven, and the bathroom comes with a bathtub. Towels as well as bed linen are provided. Please check the excluded costs for cleaning fee and tourist tax: they are separate from the total rent amount, but clearly displayed before confirming the final payment. Lodging Apartments Sagrada Familia is centrally located and there is a wide range of shops, bars and Catalan restaurants within a 10-minute walk. Sagrada Familia and Sant Pau metro stations are within the same distance. Arc de Triomf Train Station is 1.9 mi from the property, as well as Port Olimpic and the Mediterranean beaches. Barcelona Airport is 9.3 mi away. When would you like to stay at Lodging Apartments Sagrada Familia? With a stylish and colorful décor, this apartment has 3 bright bedrooms and a living-dining room with a flat-screen TV. The kitchenette includes a washing machine and oven, and the bathroom comes with a bathtub. Towels as well as bed linen are provided. Please note that there is a refundable damage deposit of EUR 300, to be paid by credit card on arrival. This apartment is set on the first floor and the building has a elevator. A mandatory cleaning fee of EUR 85 is not included in the price. This apartment features 2 double bedrooms with 1 private bathroom, 2 single rooms and a dining room. There is also a well-equipped kitchen with espresso coffee machine. This apartment has a electric kettle, hob and sofa, plus 1 double bed on the second level. Please note that there is a refundable damage deposit of EUR 200, to be paid by credit card on arrival. A mandatory cleaning fee of EUR 75 is not included in the price. This apartment is set on the ground floor and it has a small open patio at the back. This heated apartment features ceiling fans in each bedroom, a living room, and a kitchen equipped with an espresso coffee machine. Please note that there is a refundable damage deposit of EUR 200, to be paid by credit card on arrival. This apartment is set on the first floor and the building does not have a elevator. This heated apartment features ceiling fans in each bedroom, a living room, and a kitchen equipped with an espresso coffee machine. Free WiFi is available. There are 2 double bedrooms and 1 twin room, as well as 2 bathrooms. There are 2 double bedrooms and 1 single room, plus a double sofa bed in the living room. The apartment has 2 bathrooms. This apartment features 1 double bedroom and 1 triple bedroom. It includes a living-dining area with a flat-screen TV and a fully equipped kitchen with an espresso machine. Bed linen and towels are provided. This apartment features a balcony with views of San Pau Hospital. Set on the 3rd floor of a building with a elevator, this bright and quiet apartment offers views over Sagrada Familia. It comes with 2 double bedrooms, 1 single bedroom and a bathroom with hairdryer and free toiletries. We love to share our city knowledge with you: this is why hundreds of happy customers enjoy our check in staff providing insider tips, lovely places to go to and great restaurants and bars. You will feel us as a friend who welcomes you to Barcelona! We are motivated by what we do. We get a kick out of our clients having a good time. For this reason we always try to make things as easy as possible for you. To do so we give the very best of ourselves: our creativity and our sense of service. House Rules Lodging Apartments Sagrada Familia takes special requests – add in the next step! Lodging Apartments Sagrada Familia accepts these cards and reserves the right to temporarily hold an amount prior to arrival. The pictures at the top of this page are a selection of the different apartments located in the Sagrada Familia area. Please select a date and click on the apartments to see the pictures of the individual apartments. Some apartments have air conditioning or ceiling fans. Please note some buildings do not have a elevator. Cleaning fees and tourist tax are not included in the reservation amount, you can see the cost for each apartment before you complete the booking procedure, it will be added to the total amount to pay on arrival. Arrivals on Sundays and Bank Holidays carry a surcharge of EUR 15. Please note that there is a refundable damage deposit of EUR 200 - EUR 400, to be paid by credit card on arrival. Please note you have to bring a copy of your reservation with you. Please inform Lodging Apartments Sagrada Familia of your expected arrival time in advance. You can use the Special Requests box when booking, or contact the property directly using the contact details in your confirmation. There was a lot of noise from the road traffic. There was everything we needed in the appartment. This apartment was in a great location, close to Sagrada Familia and lots of places to eat and shop. Collecting the keys on arrival couldn't have been easier... we were met at the apartment and given all the information we needed in order to enjoy our stay, including information on the local area and on getting around the city generally. It was lovely to have a few items already provided (milk, water, muffins, coffee, etc), meaning we could have a cup of tea and a snack before heading back out to explore. The bed in the master bedroom had a dreadful mattress which was very uncomfortable. We found the heating hard to control however the manager was very helpful in trying to adjust this to our liking. More cooking implements would have been helpful- inadequate in some areas. More cutlery would have been helpful so as not to run the dishwasher all the time. While the location was good, the street noise made it difficult for those in the master bedroom to sleep, even with earplugs. Very noisy. The other bedrooms were not affected by street noise and were fine. The beds are very squeaky - all of them so we needed to adjust to it. Also they invest on a better pillows. Near to groceries store, cafes, train station and Sagrada Familia. The location can't be better - very close to Sagrada Familia, you can actually see it in the bedroom window. The apartment is not big, but enough for 5 people. The hosts were nice to include some small food items in the fridge for our stay, a very nice touch. The greeting manager was on time to let us in and show around the apartment, he also left us some maps and pointed out some interesting points in the city. Overall very pleasant and positive experience! Terrible bed, the mattress killed me, I had pain in the back everywhere till the morning came. My wife had similar feelings. 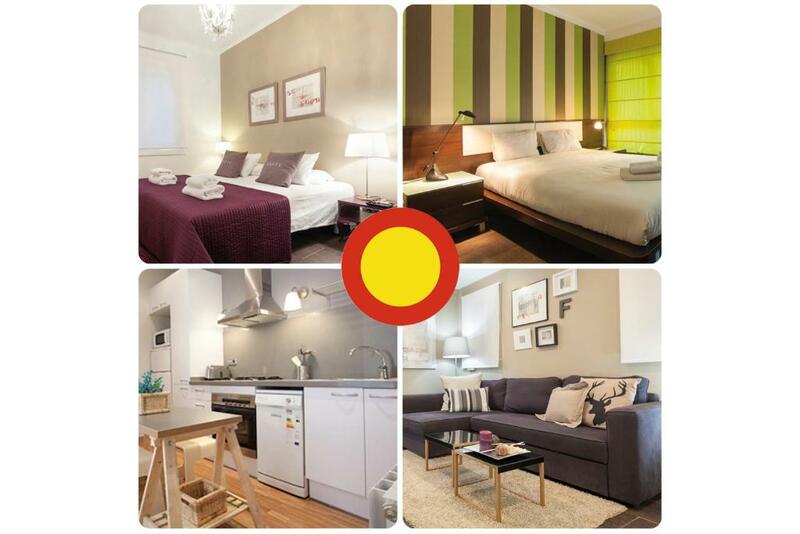 Excellent location, near to Sagrada Familia, grocery stores, metro station. Spacious flat, the kitchen was well equipped. Very easy access. The people from the property where very nice and helpful. We arrived on a Saturday at about 23:00 and was very easy to speak withe the person for the keys and make out check in. On the day of out leaving our flight was late in the evening and we could leave out bags at their office witch is very close, so we could enjoy the city for one full day.